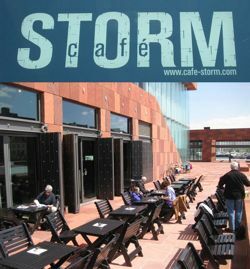 MAS STORM Café: the ‘place to be’ on ‘t Eilandje. Interior architect Kurt Hereygers used a combination of ‘rich’ and ‘poor’ materials. Leather, oak, mirrors, plywood and concrete, finished off with a warm color palette. The menu offers healthy fast food, coffee and other drinks. Restaurant ‘t Zilte & 9 Beaufort Reception Room: chef Viki Geunes moved his two-star restaurant ‘t Zilte from Mol to the MAS, where he now works his magic in Antwerp’s highest restaurant. On the south side of the restaurant, the multifunctional ‘9 Beaufort’ room is available for private parties and meetings. MAS Pavilions: the 4 pavilions at the foot of the MAS are an extension of the museum and house a.o. the MAS Shop. Three of them were designed by Crepain Binst Architecture. The MAS is a striking monument in Antwerp. It’s an extraordinary building in its own right, occupying an extraordinary site in an extraordinary location. The design was inspired by a 16th-century storehouse or ‘Hanzehuis’. The MAS collection contains over 470.000 objects and it is still being added to. A huge part of the collections is spread outside the MAS. The museum brings together a number of collections from museums that are now closed (the Ethnographic Museum, the National Maritime Museum, the Folklore Museum, a part of the collection from the Vleeshuis Museum, the Paul en Dora Janssen-Arts collection of Pre-Columbian art). 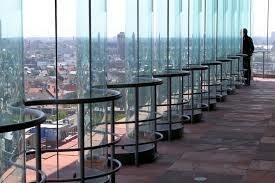 It also supports more than 200 collectors and collections spread right across the city. Together they form what is known as the ‘Antwerp Collection’. 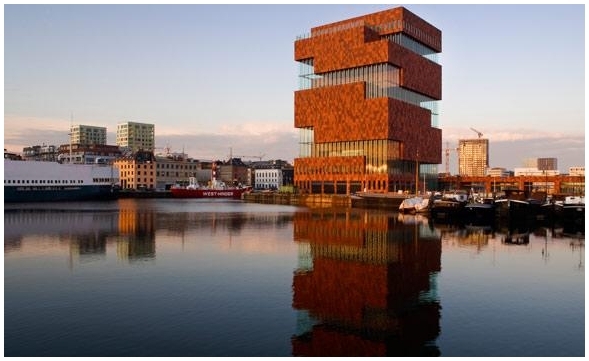 The MAS tells the story of Antwerp’s relationship with the world, which has lasted for 5 centuries. That story is open-ended. The museum has asked contemporary artists to bring it right up to date. Luc Tuymans designed a mosaic for the museum square, and graphic designer Tom Hautekiet and writer Tom Lanoye created the medallions in the MAS Boulevard. The museum also called on George Nuku and the in-house composer Eric Sleichim for their help in decorating the museum floors and the sound sculptures.